It is VERY hard to believe that ten years ago Jay and I released Rain Station's DARK RIDE. I was hoping to spend the day running around promoting the CD with Jay, but instead I went to work. After ten years I'm still as excited about this CD as I was when it was released. Let's rewind the clock...here's the back story. Back in the Fall of 2000 (Due to my online presence on 13thTrack.com Halloween Radio) I was invited to The Universal Studios Hollywood Eyegore Awards. The Universal Studios Hollywood Eyegore Awards are presented for achievement in the horror and sci-fi genre. So, on Friday, October 13th Jay and I trekked down to LA to be there, interview some folks and get some station IDs for 13thTrack.com as well as interview some of the winners for an article that I wrote. For some reason I can't seem to find the article, but I'll keep digging so I can post it here. I knew I was going to be meeting some people that night (Rob Zombie, Karen Black, Alyson Hannigan, Bill Moseley, Joss Whedon and more) and I figured it would be cool to record a Halloween CD to hand out to the folks we meet - you know, see if we can land that big record deal or get our music placed in a horror film, on TV...something. Rob Zombie had recently launched his Zombie A-Go-Go Record label (now inactive) and since I've always been a fan of HALLOWEEN and rockabilly (gothabilly) I thought it would be the perfect opportunity to push out another CD in 2000 (we had released "Stonedozer" earlier that year). So Jay and I put this together quick style and did what we set out to do. Funny how I remember working at the Gelb Music consignment shop and writing lyrics. I had rough mixes on cassette and an old tape player. In between customers and phone calls I'd try and pen lyrics. I remember being a bit frantic since I knew we had a deadline and I agreed to work extra shifts to cover a vacation. I'm a bit of a perfectionist when I record - or at least I try to be - and in this case DARK RIDE just wasn't going to get the time I would normally put into a CD. Amazing enough the disc turned out despite lack of time. Once we got back to the Bay Area from the "gig" we decided that the CD was pretty good so we mastered the disc with George Horn (Chief Mastering Engineer) at Fantasy Records in Berkeley, CA. Jay made some "videos" for some of the tracks on DARK RIDE. Check all of them out here. DARK RIDE is one of my all time favorite projects. Perhaps it is because we didn't over analyze it, we had a timeline and had to bang it out. Perhaps it was because we got to be completely goofy. Rain Station music can sometimes be awfully serious and this disc is nothing but pure fun. Perhaps it was the thrill of getting to give copies of our CD to folks like Rob Zombie and Karen Black. Perhaps it was the Halloween theme. The road trip to Universal Studios with Jay is a very fond memory for me. It felt like we were on tour. I've recently been thinking about figuring out an unplugged way of performing DARK RIDE so I can record a "Living Room Sessions" version. 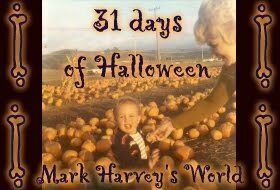 Contest starts at 10:31 pm on October 13th and runs until 10:31 pm October 20th. Have an accessible blog or leave an email address with each entry. Send me an email (here) with your favorite song off DARK RIDE and quote your favorite line from one of the songs off DARK RIDE (can be the same song) - that'll get you an entry. BONUS entry - "Like" Rain Station on Facebook - here - please provide your name or username for validation in comments or via email. 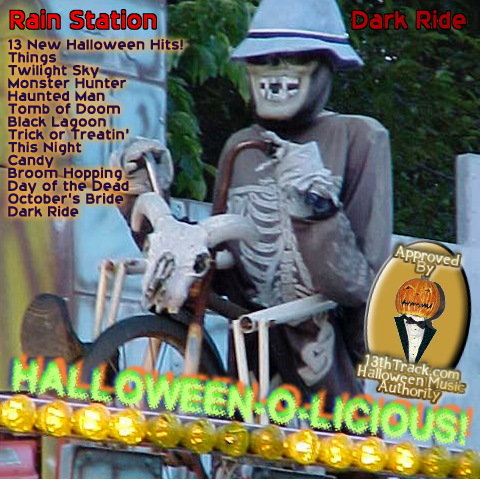 BONUS entry #2 - Review DARK RIDE on iTunes - here - please provide your email account or username on iTunes for validation in comments or via email. BONUS entry #3 - Blog about this giveaway, leaving the URL to your post in comments or via email. 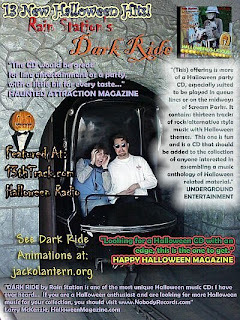 Good success to everyone and once again...HAPPY ANNIVERSARY DARK RIDE!! !